one of the most iconic movies ever: The Addams Family! The reason why we chose them is very simple. 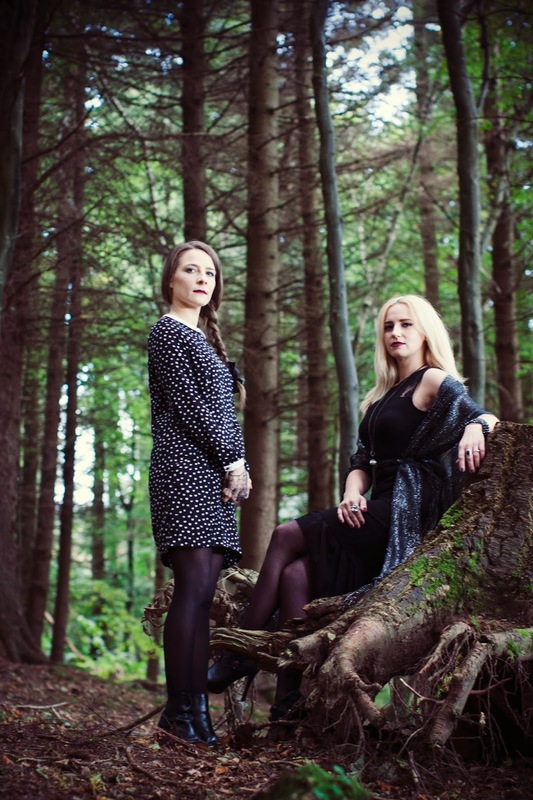 We absolutely adore Morticia and Wednesday's style! The editorial is broken down into two parts. Addams family Now and Then. The first part is our interpretation of what these characters would wear in the present times. They are undeniable fashion icons who have inspired many designers and stylists. Morticia's style is very dark and gothic. She was always dressed in elegant floor lenght gown, that was tailored to showcase the real hourglass figure. To chanel her style I chose to wear a pencil dress with a lace detail. I wore a chiffon skirt underneath the dress to create the fishtail effect that was in her original costume. To add some sparkle and modern twist to the outfit, I layered a silver kimono over the dress. To finish off my look I wore a tassle necklace, statement rings and ankle boots with a skull detail. Because Morticia always wore red lipstick,I decided to go for the shade of the moment, dark wine colour lipstick Diva by Mac. Wednesday Addams is known by the schoolgirl outfits in black&white. 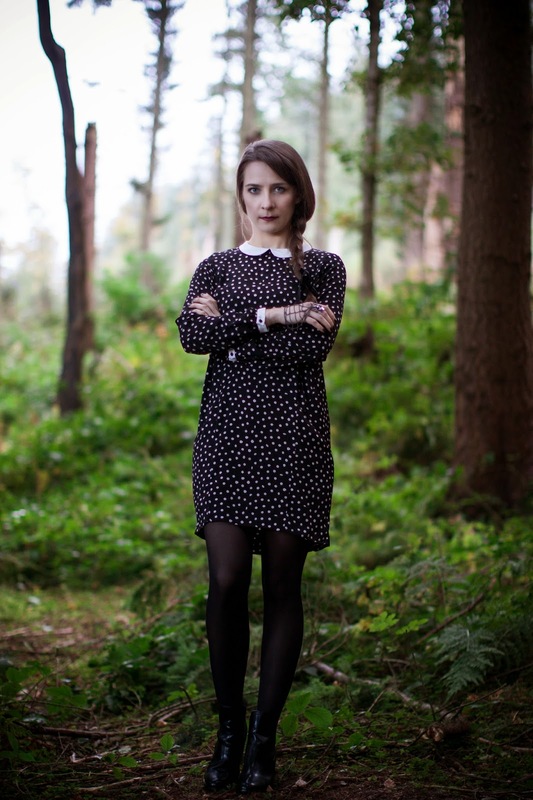 Her preppy dresses with collar are so on trend even now and you can find them everywhere on the highstreet. 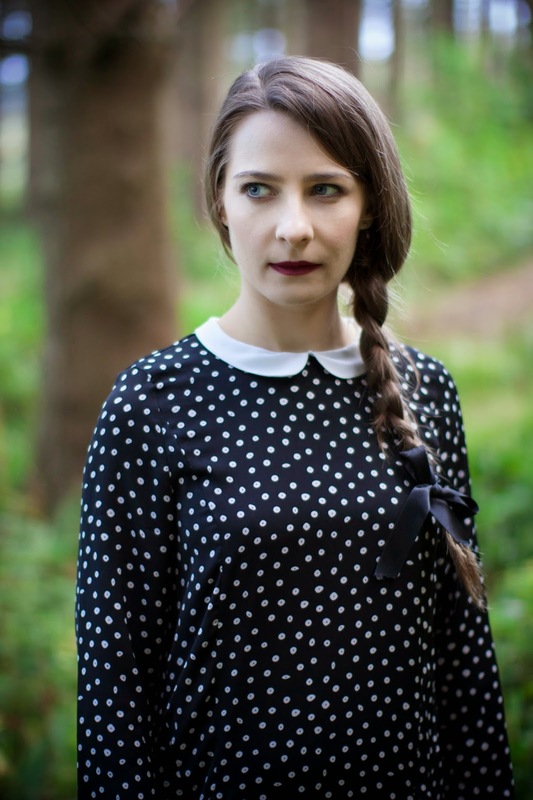 Agata's twist on Wendy's outfit comes in this polka dot number. It fits perfectly with the theme! Agata brought the outfit more up to date by wearing ankle boots and this sparkly spider hand harness. To mix it up with the hair and make up, instead of two plaits she wore just one on the side. Make up is simple as she did not wear any in the movie, but because we doing it in style gambler style, Agata put on a raspberry pink lipstick. Hope you enjoy our editorials this week. Let us know on FACEBOOK or INSTAGRAM.